I love bread. I think I might love it more than chocolate ! Crusty white bread dipping in Longevity condense milk is my weakness. If I could, I would have it for breakfast every day. There's something beautiful about biting into fresh baked bread, crispy crust and warm fluffy chewy dough inside, each bite is pure bliss. In a large bowl combine flour, yeast and salt. Add water, and stir until blended; dough will be shaggy and sticky. It will look like a sloppy mess but don't worry ! Cover bowl with plastic wrap. Let dough rest at least 12 hours, preferably about 18, at warm room temperature, about 70 degrees. Dough is ready when its surface is dotted with bubbles. Lightly flour a work surface and place dough on it; sprinkle it with a little more flour and fold it over on itself once or twice. I wet my hand to prevent sticking and gently shape the dough into a ball. I did knead it a few more times :-) It feel strange not to spend more time on it ! It can't be this easy, can it ? I put the dough onto a sheet of parchment paper (to prevent sticking), then put it in a bowl, cover the top with a cotton towel and let rest for another 2 hours. When it is ready, dough will be more than double in size and will not readily spring back when poked with a finger. 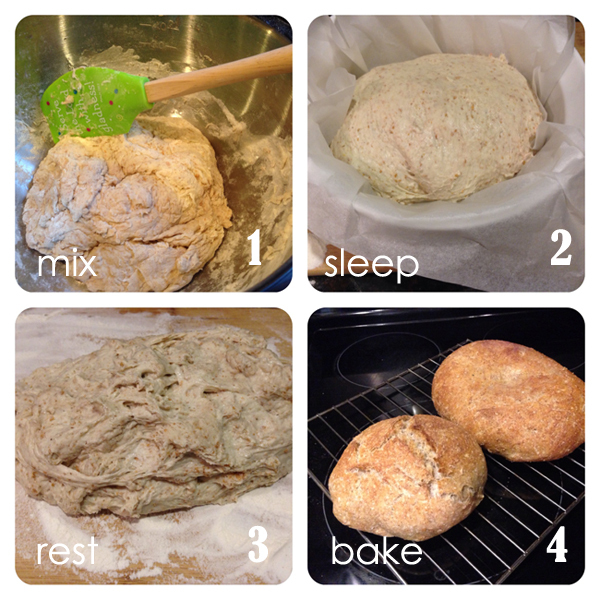 I prepared the dough after dinner and let it sleep undisturbed until next morning ! Ok I did check in twice :) I can't help it, I was very excited to see the transformation and outcome ! The result did not disappoint. It's wonderful. At least a half-hour before dough is ready, heat oven to 450 degrees. Put a 6- to 8-quart heavy covered pot (cast iron, enamel, Pyrex or ceramic, or stainless steel pot WITH NO plastic sides or handle) in oven as it heats. When dough is ready, carefully remove pot from oven. Lift the parchment sheet up, with the dough inside, into the pot. Shake pan once or twice if dough is unevenly distributed; it will straighten out as it bakes. Cover with lid and bake 30 minutes, then remove lid and bake another 15 to 30 minutes, until loaf is beautifully browned. Cool on a rack. * I divided my dough into 2 as I don't have a big enough pot. The bread in the pot turned out well, it rises higher and the top crust has the rough rustic look (left side on the top pic.). The bread in the Pyrex covered with aluminum foil (the lid for it is not oven safe) turned out just as good, just flatter and the top crust is more smooth, rounded. The crust crackles and crunches with each bite, and the inside is soft and chewy and airy. The bread tastes heavenly ! 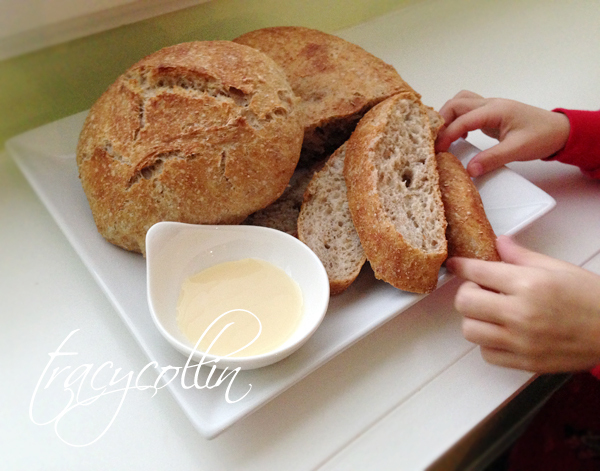 If you never made bread at home before, I highly suggest you try this recipe out. It's so easy to do. The girls and I prep the dough in less than 5 min. When we placed the dough in the oven, we waited outside the glass, staring at the dough, watching them rise and turning into golden breads. Then they filled our house, inhabited every room, with their wonderful toasty sweet aroma. Hubby got out of bed to see what we're up to and what's responsible for the nice smell. It was a delightful experience for all of us. We will definitely make this again and again.